FONTANA, Calif. – Let the debate begin. 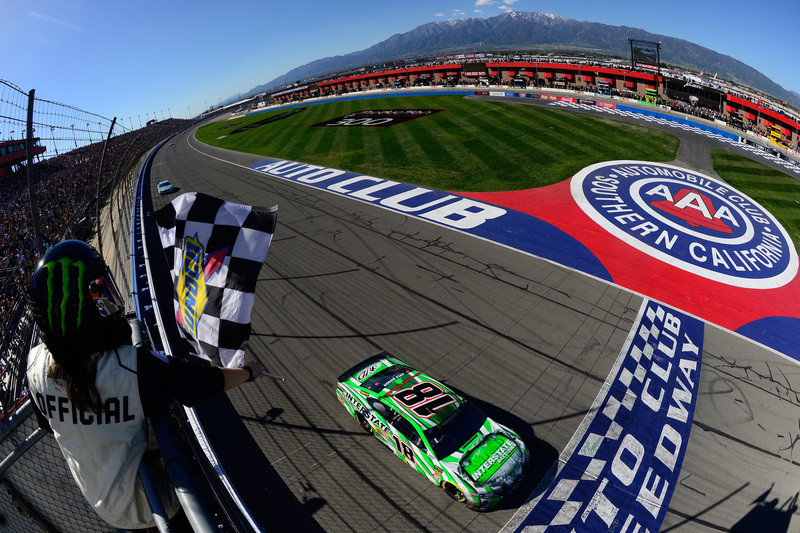 Recovering from a pit road speeding penalty with the help of a timely caution, Kyle Busch collected his 200th NASCAR national series victory with a dominating win in Sunday’s Auto Club 400 at Auto Club Speedway. 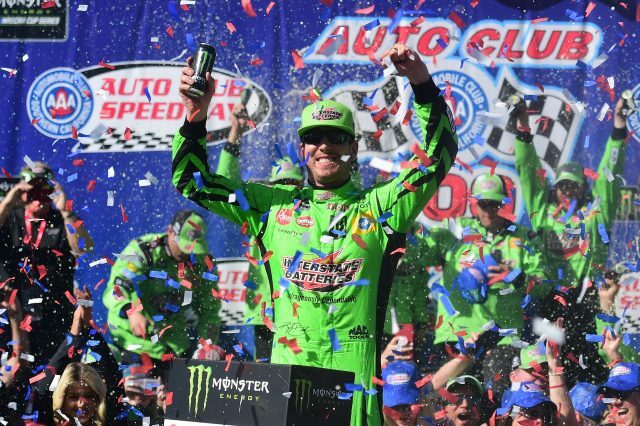 At the same venue that gave Busch his first Monster Energy NASCAR Cup Series victory in 2005, the driver of the No. 18 Joe Gibbs Racing Toyota beat runner-up Joey Logano to the finish line by a comfortable 2.354 seconds to earn his 53rd win in the series and his second straight this season. 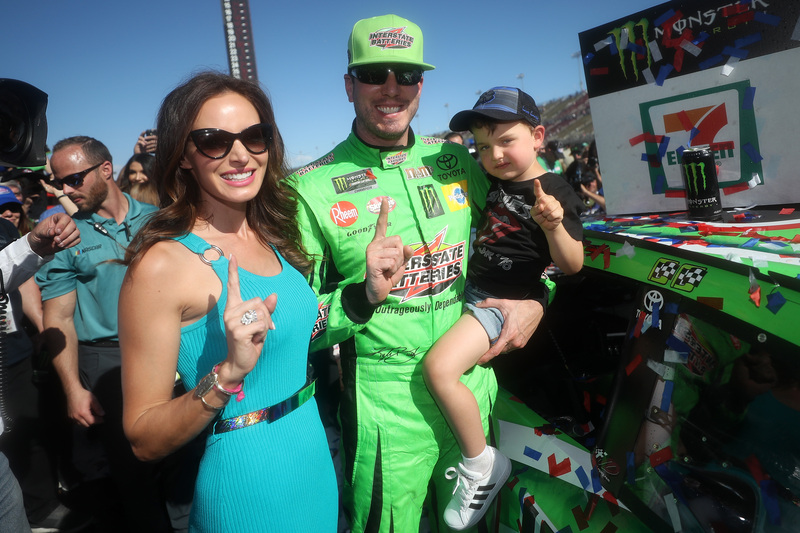 With 53 victories in the NASCAR Gander Outdoors Truck Series and 94 in the NASCAR Xfinity Series—both records—Busch reached the milestone a day after a pit road penalty cost him a chance to hit the magic number in the Xfinity race at the two-mile track. But on Sunday, he overcame the pit road speeding penalty incurred during the break after Stage 2 and powered back to the lead with 26 laps left. Now Busch will leave it to others to debate where his 200 victories stack up against the record 200 Cup wins accumulated by NASCAR Hall of Famer Richard Petty. 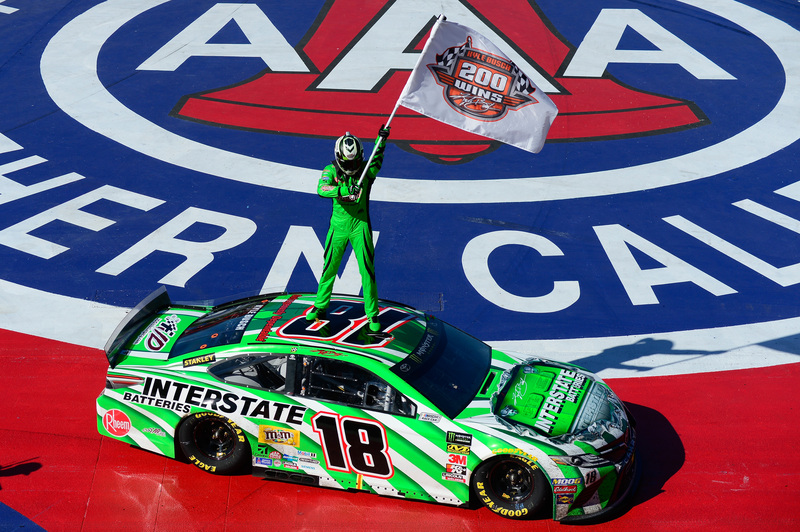 Driving a Day-Glo green Camry carrying the livery of long-time sponsor Interstate Batteries, Busch led 134 of 200 laps despite the penalty and became the season’s first multiple winner. “Feels just like number one,” Busch said after taking the checkered flag. “Feels just like yesterday. Man, that was such an awesome race car. I mean, dang! This Interstate Batteries Camry was awesome today. 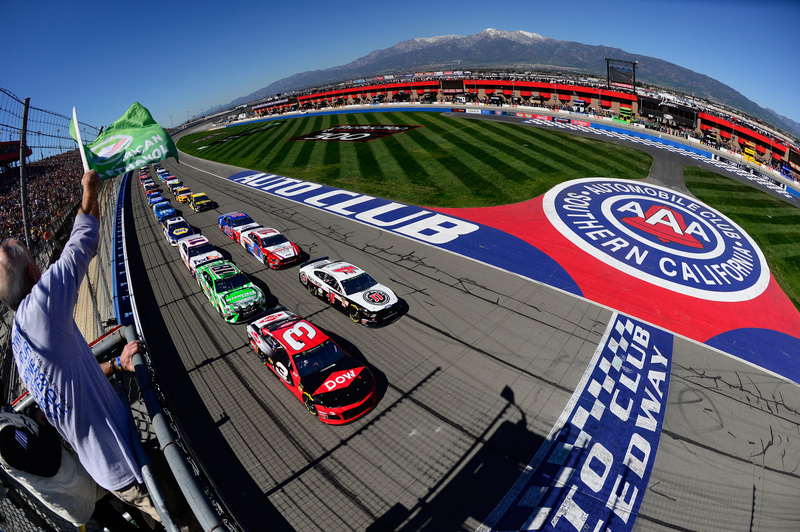 I’m glad we put on a heck of a show for all these fans out here in California at Auto Club Speedway. “It takes green to get in Victory Lane today. Today is St. Patty’s day. All these other guys were at a disadvantage. The Interstate Batteries Green Machine was flying today. Just awesome. Just awesome. To win 200, I mean, whatever it means, it means a lot to me. It means a lot to all my guys, everybody at Joe Gibbs Racing. You guys are all the best. Busch’s crew chief, Adam Stevens helped put the milestone in perspective. Brad Keselowski came home third, followed by Kevin Harvick and Ryan Blaney, as Ford drivers grabbed the next four positions behind Busch’s Toyota. Sixth-place Kurt Busch, brother of the race winner, drove the highest-finishing Chevrolet. 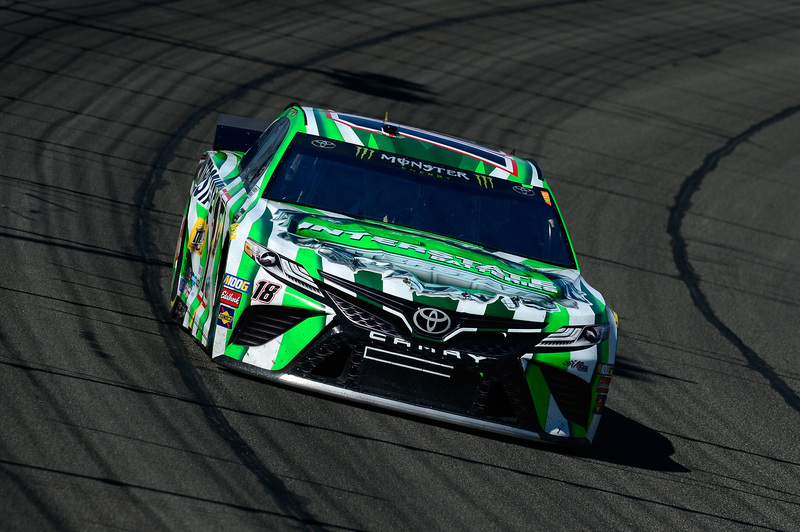 As he had done a day earlier in the NASCAR Xfinity Series race, Kyle Busch swept the first and second stages of the Auto Club 400. But if Busch sailed to the stage wins with relative ease—finishing more than five seconds ahead of second-place Brad Keselowski in Stage 2—other potential contenders had issues in the early going that cost them dearly. For Clint Bowyer, it was simply a matter of a sour engine that caused him to fall two laps down by the end of the second stage. For pole winner Austin Dillon, it was a flat right rear tire that interrupted a promising top-five run with four laps left in the first stage. Dillon battled back to finish 10th. For defending race winner Martin Truex Jr., it was hard contact with the No. 17 Ford of Ricky Stenhouse Jr. in Turn 2 after a restart on Lap 60. The accident, which caused extensive damage to the right rear of Truex’s No. 19 Joe Gibbs Racing Toyota, took the 2017 out of contention. Nevertheless, Truex soldiered on to an eighth-place result. The race winner had a turn with adversity, too. His stroll to victory in the Inland Empire hit a major obstacle with the pit road speeding penalty under caution during the break after Stage 2. After restarting 18th on Lap 128, Busch diced his way through the field and was running fifth at the start of a green-flag pit stop cycle on Lap 160. Stevens kept Busch on the track after all the other frontrunners had come to pit road, and on Lap 164, the gamble was rewarded. The left front tire on Bubba Wallace’s Chevrolet exploded, strewing debris on the track and causing the caution Busch desperately needed. With fresh tires after a pit stop on Lap 166, Busch restarted second on Lap 170, fell back to fourth briefly and but charged forward and passed Logano for the lead on Lap 175. Game over. “We only raced for two laps before the 18 blew our doors off and drove away from us,” Logano said. “Fastest car in the race. We’ve got a little bit of work to do.